I love learning from the past, and frugality from the Greatest Generation is no different. 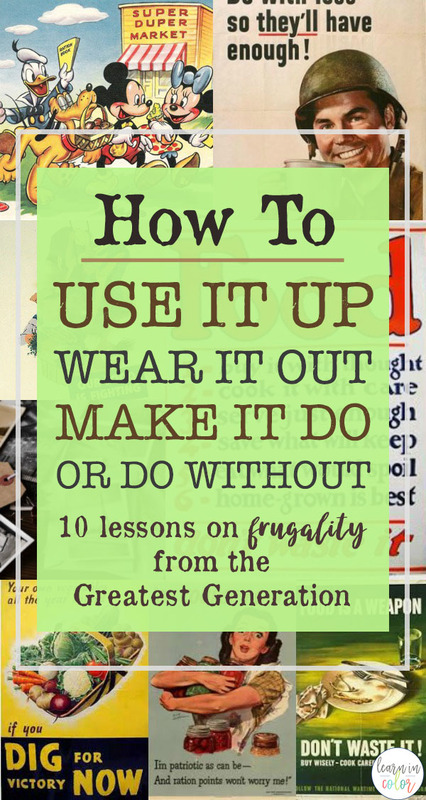 Here are 10 tips on how to use it up, wear it out, make it do, or do without – WWII frugality straight the home front! We live in an instant society. We want it now. We deserve it. This is the exact opposite of The Greatest Generation. The Greatest Generation was thrifty, patriotic, and it ended up paying off big time. It wasn’t about who had the most shoes – it was who could make a loaf of bread last longer. Imagine if our society tried – even a little bit – to copy them! My appreciation of life comes from the Greatest Generation. They simply did with what they had to do with what they had. They lived with less so others (their soldiers) could have more. They lived by the adage, Use it up, wear it out, make it do, or do without! If the Greatest Generation can live on what little that was available during WWII, can’t I live with as much as I have? I don’t mind sharing a room with my two sisters. I don’t need the newest trends. I don’t mind sharing clothes with my sisters. Leftovers are (usually) as yummy as the first night. Our society has become so wasteful! You know that last little bit of soap left in the soap container? That hard-to-scrape bit of jelly in the container? Many Americans just throw it away. The Greatest Generation was on a strict rationing system, and couldn’t afford to throw extra food or resources away. Scrape the last bit of everything – butter, peanut butter, jelly, jelly, parmesan cheese. If you don’t want to keep the almost-empty container, stick the last remnants of food into the new container. Normally new food containers are 75% full anyway. Shake ink cartridges to get a pretty decent amount more instead of throwing them away right away. Invest in Tupperware and eat leftovers. Take leftovers (from restaurants) home with you. Sometimes, being money-savvy isn’t always getting the cheapest. A well cared for, but more expensive appliance that will last you twenty years is a better bang for your buck than a cheaper appliance that will last you only two. To save money on fabric, many savvy women purposely made their children’s clothing a bit big, and then they would hem them. As the children grew, the women could then just make the clothing a bit bigger! And no one cared if it was three years old. Nowadays, most people don’t make their own clothing, and sewing your own clothes can be more expensive than buying a nice, name brand shirt at a garage sale or thrift store. This remains a great example of making sure you get the most out of all clothing. Also, I’d recommend sticking with “classic basics” instead of fads, as they’re sure to last longer in both terms of style and quality. Being frugal doesn’t have to mean having unstylish clothing! This 40s ad says it all, and is a bit of a combination of the other three tips. Like in the American Girl movie Kit, women used to make dresses for their girls out of feed or flour sacks. When companies got word of this, they started using flowered fabric, and even designed the label to wash-out. Dave Ramsey states, “If your old car still works fine, don’t go buy a new one.” Whether it be new clothes or better appliances, WWII frugality can help find creative ways to cut back and “make it do” with what you have. Although this doesn’t have much practical use, it does give us something to thing about and apply to our own lives. Five outfits was a lot back then. Shoving your closets full of clothes you don’t even remember buying hurts your budget and causes more clutter. If you see a “must-have” pair of jeans and you already have five similar pairs, you probably don’t need another. When you get creative, you can find a lot of unique ways to “do without” something, whether it be eating up the food in your fridge instead of going out or running out of a cleaner. Carpooling can save you time and money. 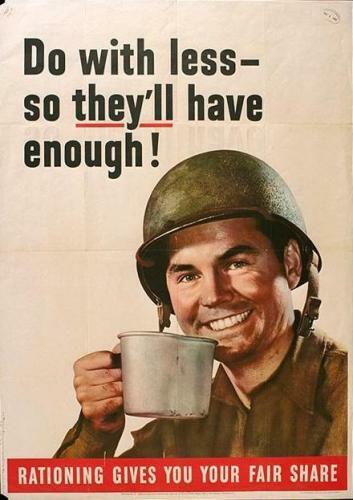 Soldiers needed petrol in the European theatre more than Americans at home did. Be patriotic! Canned food for soldiers was top priority. What did our brave home front women do? Can and grow Victory Gardens, of course! Canning can save you a lot of money, and avoids pesticides and all that nasty stuff corporations put in your food. Gardening wasn’t a supplement, it was a main source of food. Despite having to clean, take care of kids, and having to cook everything they made from scratch, Americans MADE time for their gardens. Also, many families had small animals such as rabbits and chickens. They were relatively easy to raise and were a great source of food. At the time, eating out was a luxury and pre-cooked food wasn’t an option. People made everything from scratch. Baking from scratch, although it may be more inconvenient, is the best way to pinch pennies. From homemade pizza, homemade meatballs, to homemade bread, baking from scratch is healthy, frugal, and a great bonding activity. Make it a goal to slowly start getting used to first making meals from scratch 3 times a week, 4 times a week, 5 times a week, etc. Pinterest is a great resource for finding nutritious, low-budget and easy to cook meals. Leftovers have saved us so much money. 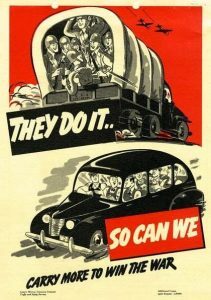 This WWII era poster applies today just as much as it did in the 40s. Nobody can be too “good” to eat leftovers. Eating leftovers can save you hundreds of dollars on perfectly good food. Freezer meals and crockpot meals (that can be made specifically for leftovers) are practical and frugal ideas for today’s family. Making meals in bulk and either eating off them for a few days or freezing them also saves time and money. This Vogue ad states: “The need for paper is urgent. 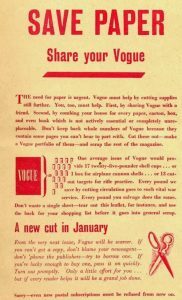 Vogue must help by cutting supplies still further. You, too, must help. First, by sharing Vogue with a friend. Second, by combing your home for every paper, carton, box, and every book which is not actively essential or completely unreplaceable. Don’t keep back whole numbers of Vogue because they contain some pages you can’t bear to part with. Firstly, can you imagine a modern fashion or gossip magazine telling their readers to share and throw away the magazine? Again, we don’t need to save paper so our soldiers can have a box for airplane cannon shells. BUT, instead of buying paper for your grocery list, why not save scrap paper and use those sheets? Why not share a magazine subscription with a friend, or better yet, grab a copy at your local library? My family has ditched napkins (we have a nice pile of cloth ones accumulated from garage sales) and paper towels. I’d also recommend using cloth pads or the less-messy diva cups for frugal menstrual cycles. Lesson from the Greatest Generation 9: Misc. Be sure to check out this great article about frugality. Remember the good ol’ days? When you borrowed books from the library and walked everywhere because gas was expensive? PBS had a series called “House” and invited people from modern times to go “back in time.” They had an episode set in the 1940s “1940s House”, and I highly recommend it. 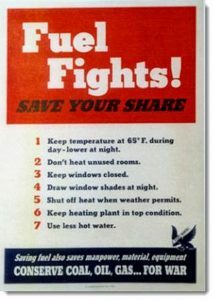 What are some of your favorite WWII frugality tips? I would love to hear them! Also be sure to share with the buttons below! So awesome, Samantha! You’re all too right- “We live in an instant society.” Sad, but true. Very helpful tips and things to remember! Fun post. I have long loved the saying “Use it up, wear it out, make it do or do without.” That is something I have really been working to put into practice in our home. Our culture is so wasteful and I don’t want to fall in that pattern too. The nylon stocking pictures were very funny! Thankfully today we don’t mind going barelegged which is what I do whenever the weather is warm enough. I don’t care much for nylons anyway. I a so excited to see that I do almost all these already! And that is likely how our family of 7 gets by on 40k a year. We don’t have TV(cable or satellite that is), we don’t have a bunch of cell phones( one that is prepaid at $12 a month) and we aren’t on food stamps, welfare or WIC. Not that those things are bad. But I believe they are meant to be used for a short time period- in an emergency and after all the ‘extras’ are cut out of a budget and even after selling a few things perhaps. This is a really great article and something that our spoiled and entitled society really needs to embrace. I completely agree with you about welfare. We do have TV, but other than that, we pinch pennies everywhere else. Thank you for commenting! My parents were children during WWII. They were also farm kids, so a lot of what you mentioned filtered down naturally. I grew up with a garden and know how to can (just getting back into it). I can sew enough to get by, but not well enough to make all of our clothes. I buy most of the dc’s clothes at yard sales or secondhand stores. We haven’t bought a new car in 6 years. I cook for leftovers so dh won’t have to buy lunch. That’s not to say we’re perfect, though. We didn’t need the car we bought 6 years ago. I’ve bought shoes on sale I haven’t worn yet. We buy too much convenience food, in my opinion. But we’re getting there. Thanks for sharing your story! My family definitely isn’t perfect either, but we’re slowly trying to get up there. Congrats on being able to sew and using leftovers – that’s way more than a lot of people than I know. Was raised by my grandparents, so I got a good dose of frugality as a child. It went away after I grew up and was married to a man who was embarrassed by my clothesline. I became a terrible spendthrift, because I was trying to fill an empty space in my life. Now I’m married to a man who not only doesn’t mind my thrift–he brags about it! Wonderful post–look forward to more. My grandmother never bought Tupperware! She had stacks of butter and cool whip containers instead. We now need to be careful with plastics to be sure they are dishwasher safe and microwaveable BUT many restaurants like Chick-fil-A and Olive Garden will give you to go containers that ARE safe for your microwave and dishwasher. I love re-using these containers, and I’m sure there are many other opportunities out there to save on expensive containers. Great post! I am a lover of vintage and sell vintage clothing. But for me vintage is more of a state of mind. We need to get back to a more simple time, especially in the frugality department. Waste not want not. To me being thrifty isn’t shameful, it is thrilling. Some people feel better about themselves in a $70 t-shirt, but I look at that $70 and see how much I can squeeze from every penny. It makes me sad to know that so many of these things mentioned will be gone from our society when this generation is gone. Things like sewing, canning, making from scratch, will all be completely foreign words in the very near future. Let’s hope people like us can breathe new life into these things! Keep up the awesome work! Thank you for this great post. I’ve pinned it. I think people born in and after the 70s have no idea what it is like to live in times of scarcity. My parents were born during the war and things that we now take for granted were shared and handed down. It was only during birthdays and the new year that you got to eat a good meal. My mum would always lament at how spendthrift and wasteful people are these days. Not true. I’m 32, have two children, my husband and I both work, garden, cook entirely from scratch, recycle EVERYTHING, raise chickens, eat organic, don’t have cable or phones, and our once purchased new cars are now 10+ years old. We, and some our ages, see the value in saving for the future and making the best with what we have. Thanks for the great article!!! Thank YOU for your awesome message! Kudos to you and your family! You made me smile today! I love everything you posted about and I wish we could transform the world back to the way it was! I am trying to influence others to be like this and get my family to see how important it is to conserve what we have, use what we got and don’t buy junk we don’t need. Harder than ever in this society though 🙁 Keep up the frugality and I hope you will pop by my blog to check out my frugal tips and funky stuff! If I may be particular for a moment: Africa is not a country (2nd paragraph). I know that’s not the point of this post, but it’s an error that I think is worth correcting. Thanks! lol thanks for catching that! 🙂 You sound like me – little things like that drive me nuts. Changed it! thanks! Love the article..now I wash only in cold water and put out buckets to catch rain water to water the garden.and wash and reuse storage baggies..plus I put a little water in the salad dressing bottle to use the last of it. I use rags to dust and clean with. Its frugal and green way to live.. Easy to do. Oh dear. This was very obviously written by someone who was homeschooled. Did you just call Vogue a “gossip magazine”? Well there goes your credibility. Ouch. You’re right… it had to be written by someone homeschooled. Only homeschoolers would seriously consider raising rabbits in order to eat them! Amen, we thought about using rabbits! Loved your post by the way! Thanks so much for telling me about it! I just looked it up – that is awesome!! The whole series looks so good! I love these tips! I tend to be much more wasteful than I realize…I needed these reminders! This is a GREAT post. I agree with everything in it. Well…. except for the rabbits. Chickens would be ok. This is a great post indeed. Will definitely need to share. I like the concept and the old images! I enjoyed reading your post. I remember my grandmother telling me about how her father would paste cardboard into the soles of their shoes when they had worn holes in the bottoms. I try to live simply but I still have so much excess. Oh wow, I have never heard that one before. Although some may not do that today; it’s a great example of many people today don’t really know what “cutting back” truly means! Awesome post! My family raised a huge garden and we all pitched in to care for it and helped with the canning. We NEVER ate out, too many kids. Everything was made from scratch and yummy. My grandmother made all our clothes or we had hand-me-downs. We got one pair of shoes in the Fall and that’s it! But…..we were fine!!!!! I am learning to do more for less now. Back into a garden and begged our Mayor for chickens but he refused. I will try again. I am doing more scratch cooking with simple meats and veggies, no processed foods and we are better for it. I think Americans are becoming more realistic about their budgets, the credit cards are weighing them down and they are trying to do better with what they have. It’s getting there. Having the weight of debt off your back is so freeing, its worth almost anything! God has blessed this country with so much. Can we not do better with what he gave us…..Thank you it was quite inspiring. I love the 40’s. People back then had their priorities straight. This post has so many great tips in it, and I will definitely be using these. Thanks! I am visiting from Frugal Friday Link Up Party. I loved this post. The past generations have pasted on many great tips. Although… painting gravy on my legs and eating rabbits wouldn’t be on my priority list for being frugal. hehe! These are great tips for saving money and using what you already have! I hate the feeling of just going out and buying something new when I could have made it myself or found it second hand. I think that whole concept is so wasteful! Oh and I love all of the history in this article- it was very interesting. Thank you for sharing this! I liked your posting but would like to add to it. My grandmother and her sisters were all raised during this time period. My grandmother lived on base and would write to her sisters often. When a family member was in need, they wrote around asking for things. My grandmother and her sister often shipped gently used hand-me-downs from one to another. This was an extension of not just being frugal but also helping family members when times are hard. So before you think of getting rid of an item….see if someone in your family can use it first. Or if you can recycle the item into something else. Also, your comment about sewing….I would disagree with you. I also used to think sewing was often more expensive but it’s a myth. First you have to really sew and know how to do all aspects from mending to tailoring. (You don’t want to make a garment only for it to fall apart after one washing!) It’s cheaper to hem your own pants than to pay someone at the dry cleaner. It’s also cheaper to upcycle old sheets, blankets, t-shirts and other things into garments to wear or even pillow covers. (Google upcycle or refashion for ideas) But there are also cheaper ways to get GOOD quality fabric. Go to estate sales, look on etsy, and antique malls. I once bought an entire garage full of fabric for $60! Now some was old – and it had to be sorted to see what was still good and not smelly or full of holes. But for the most part, I walked away with a bargin. This is also what my Grandmother did….she had “other” methods for saving. Not hording – but saving and collecting cheaper options for when times were hard. 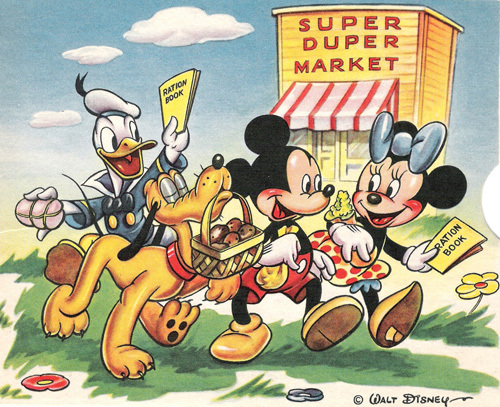 I have plenty of material to sew up now…but that’s also a good thing……like a garden..I can use it for my family in times of need AND since I have a “trade”, I can also sell goods that I make! 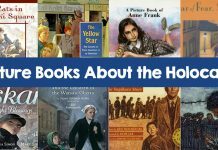 I do love the fact you are a home schooler looking into all this and publishing articles – I think “kids” of your generation as well as our own need to really think about going back to basics and what Grandmother did do when she didn’t have……. Thanks for publishing this and keep up the hard work! Neither my husband nor I were raised to be frugal and now I blog, in part, about frugality. The recession has hit us hard and we have had to learn to completely re-think everything. We spend as little as possible, do without, reuse, garden, can, cook from scratch, raise animals – anything we can do to save. I haven’t seen a lot of these ads from the past, so thanks so much for sharing them. I’m hooked on your blog! I think I know how I will be spending the rest of the evening. Thanks so much for the post, Samantha. Samantha, this is an excellent article. My parents lived through the depression and WWII, and I was raised with many of these frugal tips as a way of life. One thing my mom shared that I have never forgotten: Her sister did not have writing paper, so she rolled the envelope inside out, wrote on the inside, then rolled it back right side out to mail it! I look forward to going back to read your other posts in this series. Thank you. Great site, Samantha! As a Nurse Practitioner I often advise people to walk, garden, cook at home and eat leftovers – all are healthy alternatives to modern habits. I have a small paper “How to Bake by the Ration Book” cookbook that she received in a bag of Swans Down cake flour back in 1944, 2 years before I was born! Kate Smith, the famous singer who was first to perform (and then popularize) “God Bless America” wrote the forward. The low ration recipes inlcude eggless cakes, no sugar desserts, low shortening recipes, substitutions for meat… I’ve tried most of them for fun, and then made many of them again afterwards because they are healthy and delicious. This little complimentary book mentions Swans Dwon flours of course, but the emphasis is saving precious resources for the war effort. It’s still wise, and I’ve photocopied it for my adult kids who love using it too. We CAN take a page from the past and make it work inour modern world. Thanks for your efforts, and keep up the good work. Sorry, Samantha – my brain ran ahead of my fingers typing! I meant to say that the cookbook in my previous comment belonged to my Grandmother deLacy, who gave it to me. She died in 1993, but I grew up hearing her stories of conserving everything during WWII. I’m a lifelong jar-scraper too. Current pet peeve: those new ribbed plastic jars you CAN’T scrape. Grr. Thanks! 🙂 I am super passionate about this subject and it’s definitely one of my best posts. I think the jar is a marketing thing..And amen! I so want to travel more when I’m older! We take our bous holy jeans and sew them into shorts for summer and no one can usually tell. However we may have to start patching because they have so many shorts. Loved your post! Definitely can learn a lot from those who lived during the depression. I learned a neat trick with mustard. When there is that last bit you can get out of the container… add a little apple cider vinegar, a little olive oil and honey and shake well…. I now have my own honey mustard dressing for salad. Its real yummy. I used apple sauce to bake in place of my oil. Sometimes if I can plan ahead I can add a little water and swish the jar to get the last bit and use it in a baking recipe. I don’t feel I add much water to have to change the amount of liquid I use but one could adjust for that. Another is a yummy recipe of my mom’s where she uses a small bag of frozen raspberries (thawed), 1 small box of rasberry jello and the cold water is replaced with the juice of the thawed berries and applesauce to equal the amount of cold water — again you could use the last of the applesauce and mix a little water to rinse the jar and pour into your measuring cup. Typing this I am thinking of a way to rinse the jar and freeze the left over for those baking and jello occasions. : ) I also make my own laundry soap and cut up old Tshirts to use as dusting rags. I use old shirts also out in the garage for rags, or for painting. The kids jeans do become shorts for the summer. They are used to that. My mom used to make all our clothes. I am not the best seamstress so I utilize garage sales, hand me downs or sales at the stores to try and save on our clothing. We also donate what we grow out of so someone else can have use of the items. We try to take the best care of our things so we (the kids) grow out of them before they are worn out so someone else can make use of them. Thanks for your comment and neat ideas! I’ll have to try that sometime! I LOVED your article. However, I have a problem with one part – rabbits. 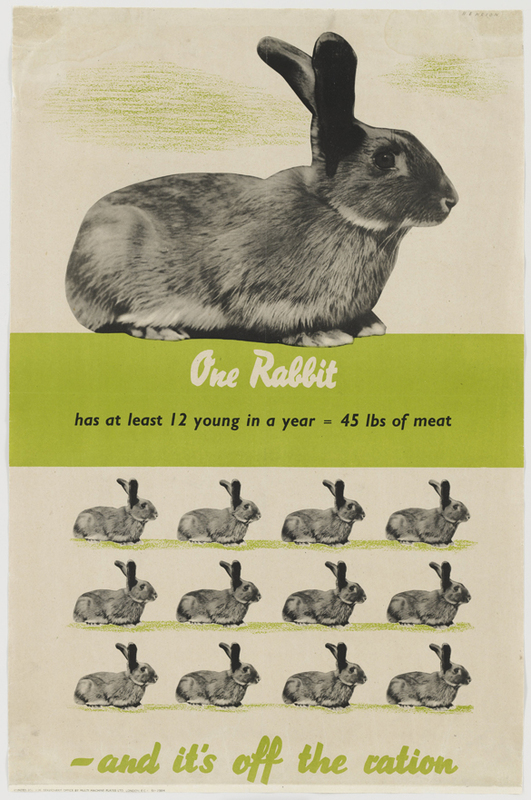 I understand that back in the 1940s, rabbits were probably raised for the meat alone. I’m a rabbit lover/former owner and I do NOT condone raising rabbits for the meat. That’s just cruel to me. Other than that part, I agree with all of the article. I assume you are a vegetarian then?! If your happy for a farmer to raise a cow so you can have a Sunday roast, you should see no difference in someone raising a rabbit for theirs! Even though your article has some great points and at times cute and interesting, I have to say it, Great Depression generation was far from great. They had their ups and downs, good and bad people just like our generation does. The same people or generation you praise for saving started the Great Depression in the first place by over spending and using up or countries resources and money. And even after women helped during the wars and went to work, the moment the men came home they were pushed out of the jobs. Even if a woman had lost her husband in the war and no longer had a man to help take care of her but had children to feed. I can’t tell you how many older women I’ve interviewed who said they had no choice but to marry inorder to survive. Which is what helped cause the 60s woman’s rights movement, not just because women wanted equal rights but because they just wanted to provide for themselves and their families. Also to say that everyone in our generation or country feels like they deserve or should have stuff and not work for it is wrong too. I grew up poor and have friends that did too. I had to fight, work, save up for everything I have and even still to this day have to share a lot of it with my other family members because we just don’t have enough. Okay I’m done with my rant now. Hey Alexandria! Thanks for your comment! You’re right – every generation has its good and bad, and I by no means think the Greatest Generation was perfect. 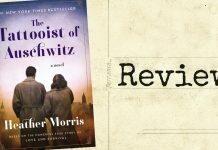 They were, however, notably the greatest of the Great – those who grew up during the Depression, and helped fight and win WWII, and the incredible frugality shown by women of the era. The Greatest Generation did not crash the stock market – that was the Lost Generation. The Greatest Generation was their children, actually. As for your other points, this is not an article on feminism, nor am I have feminist; and I won’t start a political debate on feminism. Whether or not you agree it was the Greatest Generation or not; it still was a fantastic time, and the frugality tips during that time are quite noteworthy and can still be modern. This girl buys super cheap ugly clothes from the thrift store and remakes them into super cute outfits. She is adorable! You might enjoy taking a look at her blog. She didn’t have sewing experience when she started this, so you can be a beginner and still learn how to rethink old clothing into new looks. Thanks for posting your article! I’m pinning it! 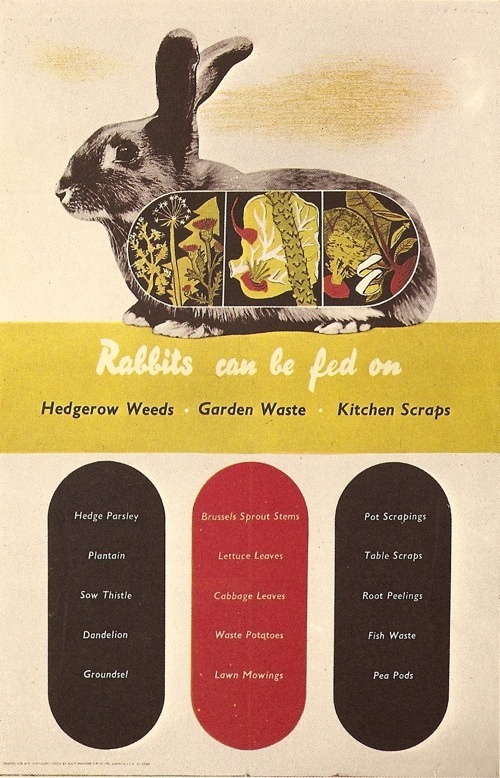 During WW2 my Dad was afraid we might go hungry, so he built hutches and filled them with rabbits to eat. Low and behold, he didn’t know he didn’t ‘t have the heart to kill and dress them. So a good friend would come over and do the job for a few of the rabbits. My Sister and I liked rabbit meat, but not if it was one of our “pets”. Any rabbit we named and played with got off free. Not much other meat either. That took ration stamps. Leather shoes were impossible to find, and that was before plastic was around, so we were very careful. Being frugal wasn’t just a matter of money, it was also a matter of availability. It was good early practice for me. My husband and I retired early to travel and live in “gentile poverty”. We’re loving it. Aww yeah, I have had rabbits and although I do enjoy rabbit meat, I could not eat the rabbits I have owned. Very good points you brought up and I do hope to live in “poverty” all my life and spend that money on TRAVEL. 🙂 Thanks for your great comment! This pin really caught my eye because My 10 siblings and I grew up with that same phrase coming from my mother. Thirteen family members growing up on a farm during the 40s, 50s and 60s had to make it do or do without! I am very frugal to this day, and use many of these suggestions. Thank you for helping me remember the great (and sometimes hard) times of my childhood. Another tip that has helped immensely over the years is to wait a bit – sometimes till the end of the aisle and sometimes the next day or week, to make the decision whether or not you really need “X”‘ and you will be surprised how a shoet amount of time can help you realize what you need oe don’t need. That is why retailers work so hard on the ” Impulse Purchase”. It is a real thing! Thanks again for this post! I am repinning it and sending it to all my siblings! Very true! 🙂 Thanks so much! Great post and message! It reminds me of how much more I could be doing to be frugal. I am constantly patching, fixing and redoing my clothes in order not to buy new ones very often, and when making crafts I try using what I have on hand. One thing I could be working on much more is in the cooking from scratch and leftover dept. A few questions. Is it possible to be too frugal, and also is there anywhere to watch the episodes of that show on PBS? I remember seeing Frontier house when it was on but a 1940’s one would also be interesting. Yes, I do think it is possible to be too frugal. In my honest personal view, a person should be frugal to a) take care of their family and b) to better themselves (ie self control, no buying, problem solving, etc.) I think if a person takes frugality over their family it could be a negative..
And about the PBS, I have no idea. We rented it from our library, and I think they may be quite rare. Anyways, I’ve seen 4 of them and the 1940s were the best by far. Thanks for commenting! I think she was asking if it is possible to be TOO frugal, as in taking it too far. I think anything is possible. I think it would involve more of a heart issue, like fear (of what might happen if we aren’t frugal) or pride (for being so frugal). That’s my 2 cents. Try looking on Youtube. Someone may have posted the show you’re looking for. A good show that I like is wartime farm, part of a series on farming set in different eras in England. They’re done by historians and archeologists. The shows don’t just focus on farming but also on the home and the job of the farmers wife. Very informative. I don’t know any straight from WWII, but I love these. I think things are so cheap and so easy to get that people don’t appreciate how hard people have worked or think about how much they waste. Thanks for the reminder and linking up to Turn it Up Tuesday. Have a great a week. I am very impressed! I absolutely loved this article and determined to love it even more when I saw you are a teenager. Great research and information. We use a lot of these already. Cooking so much and every day from scratch has led my children into a deficit when eating out (they are not accustomed to having to order food!!) In tight times I have considered taking a part-time job until I realized the money we would have to spend to make up the difference of what I wouldn’t have the time to do anymore wouldn’t be worth it. Thanks again for the great article and inspiration! Thank you very much! I just added the cloth pads idea. Thanks!! I was raised in the 60’s and my Mom had us save up all the wrapping from the mandarin oranges at Christmas time to use as toilet paper. We complained until she told us that, when she was a girl, they used pages from magazines (youch!). As an adult, I lived in a developing country where leaves were routinely used for this purpose. This is a great post, Samantha – thank you! This was a very interesting read! I was raised partly by my grandmother and grandfather, so I grew up with stories like these from WWII and from the Great Depression. These ideas stuck in my mind so that they were a great help as I have been rearing 15 children on one income. Thank you for taking the time to find the terrific images–they really add. Thank you for the inspiring post. Having grown up very poor and raised by Depression era parents, many of these sounded very familiar. I think it is something we have forgotten and needed to be reminded of. Thank you and Have a Fabulous Day!! Thank you very much – and very true! These are great thoughts, Samantha. If you ever get to travel to any developing nations you may be surprised to see that folks who don’t live in Western nations know how to contrive like our Grandma’s (or Great-grandma’s) did. The things we take for granted here in America are not always considered “necessities” elsewhere. (Consumable paper products being one example). I personally think you have gone way too far with your ideas on frugality!!!!! Not being wasteful and recycling are one thing, but going so far as to use cloth pads during your period? Come on!! Or to suggest raising rabbits for their meat? Where are you coming from? You are not normal!! PS I’m not normal. And I’m pretty darn proud of it because no one “normal” ever became anything in life. Thanks! I agree with you Samantha, we raise our own pork, beef, chicken and turkey. I try to use all of the animal and can as much as I am able to. You are on the correct path, keep up the great work your amazing young women. Samantha, congrats on your response! You have great ideas and are in no way forcing them on people. We can take what we like and leave out the rest. Thank goodness we are all difrent and what may not seem “normal” to some, may be just what another needs. Wonderful response to a nay-sayer! Many women DO use cloth pads, both for frugality and health reasons! Rabbits can be grown in a small space, and are a wonderful way to grow inexpensive food, as well as learn to care for animals. 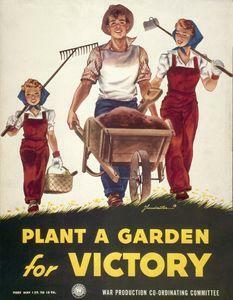 Their droppings can help fertilize a “victory” garden. These are great suggestions! If an idea sounds odd, perhaps one needs to ignore it, rather than throw insults. Awesome info! And your right….Normal sometimes doesn’t get the job done! “Normal” is only a setting on a dryer. Lol. 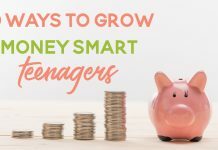 I think that saving money is a wonderful idea for a young person. Money is freedom! Freedom to go to a better college, freedom to travel and learn a second language, freedom to buy your house sooner, freedom to do charitable work. You go, girl! You are SO normal! You make better choices than most people older than you do. I do a lot of stuff you suggested or grew up doing it. Do what is right for you and don’t listen to what others say in their rude comments! You are living in the past..who, today, could kill and eat cute little rabbits…not me!!! She’s living in the past? The entire series is inspiration from the past haha that’s the whole point! Nobody is making you do anything you don’t want to do. That being said, raising and harvesting your own animals ensures that they were treated and harvested ethically and humanely. Much more than what can be said for what to get at the grocery. If you had nothing else to eat, you would eat rabbit. Just choose one for a pet and treat the others as livestock. When you are hungry and have no food in your house, you would be suprised at what you would do to eat and fill the bellies of your kids. But, if raising rabbits for meat, DO NOT buy a rabbit from a pet store. Rather, find rabbits bred for meat. They’ll be rabbits just the same, but it will help the meat, and possibly help cut back on the guilt for using a usual ‘pet animal’ as a meat source. So many people have no clue what it is like to go hungry. Look at those struggling on the streets of Venezuela right now and throughout the world in our day and age. They would be happy to find a stray roaming the streets if it meant food on the table to keep their children alive. Even “cute” little animals can provide sustenance. People may want to keep this in mind when they down their chicken nuggets, burgers, veal cutlets, gyros, etc. while branding others as abnormal or cruel. Also, they may want to rethink the whole “it’s in the past” mentality with the direction that our nation is currently headed. Remember… Venezuela is a socialist nation. The same people who can kill chickens, I couldn’t do it, but admire those who can as I love my meat just too chicken to kill anything. I love animals too but it’s a whole different mindset. I’m past the need now, but for many years in the 1990s I used reusable pads and an item called “The Keeper” (an earlier version of a Diva Cup). I think that is a wonderful suggestion, great for both the environment and the wallet, why would you be so critical? And while I don’t eat meat, the waste from my pet rabbit is a great addition to my compost. If you do eat meat, then I find it quite hypocritical to be offended by the idea of killing your own. You may think this young lady is weird, but I’ll tell you one thing. She’s going to survive. You on the other hand…Doesn’t look to good for you. You need to take a step back and chill. Normal people do these kinds of things all the time. To each his own. If you don’t like her suggestions feel free the hit that X button on the top of the screen but don’t criticise other people. It’s not polite. There is nothing wrong with wearing cloth pads if it means putting shoes on your childre, paying your rent, feeding your family. I applause anyone who does get outside the narrow minded modern world thinking and can achieve great things. Great article! I wish I had room for rabbits, maybe soon. I do many of these things, can, gardening, sewing and such. I used to have chickens, but we are getting ready to move so I had to give them away for now. I loved them for the fresh eggs, excellent compost and meat. I did take care of my own, though it pained me to have to do it to an older cherished hen. I even fixed ones broken leg once! I think you are doing great. As a mom of 6 kids I have learned through trial and error what I can and can not make from scratch. Some things like loaf bread they will eat in one day, but yogurt they wont touch. I am learning what works for us and that is about all anyone can do. I would add that hunting is something everyone can do too. We do, we have even butchered a deer at our house. It was interesting that’s for sure. Oh also, most people don’t think of fruit trees. Even though we have a small yard I had room for an apple tree. Its only 8 years old and we get more apples than we will use. We live in an older neighbor hood and there are several fruit trees around, even in the city. Most people used to grow a fruit or nut tree too. You just have to look, and ask and most people will share the fruit and nuts. Very true!! And hmm..I definitely haven’t thought of growing a tree! I tried garlic and it died lol..(I don’t think I did it right). But I would LOVE to have an apple tree. Thanks so much for your suggestions! you cannot get apples if you have only 1 tree. unless someone nearby has one! Actually you can have one apple tree. You just have to graft a branch of another variety on to the tree. Many fruit trees can be done this way. If you want a certain type of apple tree, such as honey crisp, you need to buy it from a nursery. Do not, I repeat, do not grow from seeds taken from the apple you eat. Because of cross pollination you won’t get the same type of Apple, in fact each seed will be different type. I hope this helps. Have u tried making the cheats yoghurt my children also wouldn’t eat home made yoghurt but buy a 1 kg vanilla flavoured yoghurt and use that as the starting culture, then when the yoghurt is made add the rest of the bought yoghurt. The flavouring is so strong that it flavours the whole double batch. Ten times cheaper and you can keep using it until u loose the flavour. Have been doing this for years. Got it off Simple savings. I am the first batch of baby boomers after WW2. We lived just like the depression and we had my Grandmother live with us. My Grandmother was a vital part of the family, not like now she was not put in a home. She helped with what she could, and often just sat and visited as we did things around the house. She was a wealth of information, her knowledge was worth another paycheck alone. We gardened, the front yard was potatoes, the back and sides of the yard were regular food garden, and flowers here and there to bring the bees. We ate well, and to this day I have a small garden. We patched, mended and sewed our clothes too. We would take old worn clothes, take them apart, turn them inside out and make new clothes from them. I had a coat made from a jacket my Dad had. There are other things I remember too, but I must go for now. I hope you keep up your interest in the past and it helps you in many ways with your future. Samantha, you are lovely. I SO enjoyed reading this and will be sharing with my girlfriends that will love it too! God bless you, and continue to keep things in perspective for yourself and others. Wow, the cloth pad comment was pretty insensitive, it’s what women did hundreds of years ago! (BTW tampax wasn’t always around!) anyways, its starting to be a trend again, not only because of the chemicals companies put into them that are very harmful for our bodies, but also they last years if taken care of properly, are esentially free (if you have basic sewing skills and some towells and cute fabric laying around) and don’t make waste! Where i live they are not common and i’ve even started selling them! fine by me! Gee, sure are alot of interesting comments. My mother and Auntie told me stories of exactly what is in this here post. They said you would wash out your “rags”, then lay them out on bushes to dry allowing the sun to bleach them out as much as possible. What this all boils down to is how blessed we are just to have Kleenex, a toilet that flushes and so much more their generation could only imagine at that time. Ingenuity for survival from the days of yesteryear, that is what this here article is all about! Many thanks for linking up at Mom’s Library!! Love this post. My family doesn’t use kleenex tissues. We have flannel wipes that are just 8 inch squares served around the edge. Not only are they frugal but they are natural (100% cotton) and they save the nose because they are so soft! Win win! I definitely may consider doing this. I make reusable paper towels, and have tons of leftover scraps. I can’t garden I live in apartment.,I do cook in a crock pot it’s only for me and my teen daughter but I really like the article and that u are a teen that knows about living on less. You can garden! Plant in pots. Use a large garbage can to plant potatoes. Look on the internet for ways to grow 100 lb of potatoes in a garbage can. Hi Samantha, This is great. I love the lessons from the baby boomer generation. You are pretty awesome too. Samatha: Great response to an unkind comment. You on on the road to great success by handling difficult situations so perfectly. I am 60, and it has been difficult to raise children to realize the past sacrifices all people made to keep us free. 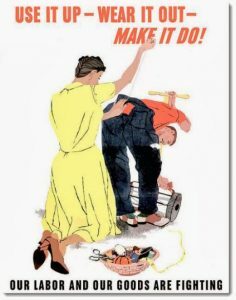 The 40’s were not perfect for many (people of color, sexism, etc); but they were not wasteful. Thanks! Yes, I totally agree! I think it’s important to learn from both the good, and the bad. Wonderful. Gives me hope for the next generation. My children do not appreciate how I tried to teach them to save and not waste as my parents taught me. Thank you. Don’t forget about using cloth diapers on babies. They are designed differently now much easier to use. It saves a ton of money and space in the landfill. A couple of other strategies our parents and grandparents used were to share and to do as much for themselves as possible. If you have more potatoes than you need, you give some to your brother who shares his extra carrots with you. If they needed a small home repair or construction project done they figured it out or asked advice from someone who had the skills. Today it is so much easier for us, we have YouTube but so many people just buy more stuff rather than repair what they have. I am sitting next to a lamp that is in its third incarnation; bought it new, re wired and changed color, changed harp (and orientation of bulbs) and shade. Each time something has gone wrong I’ve found a way to continue to use it, saving well over $100 in the process. I am comfortably retired, prior to retirement I made a comfortable wage. But I was born in 1953 and was taught to be frugal by parents and grandparents who went through tough times. To me it isn’t so much about being frugal as it is about conscious spending, saving pennies in one area allows you to spend dollars in others. It is also about not wasting resources. With reasonably good money management I was able to quit my full time job and go to nursing school as an adult (with a family). Decades later when my working conditions became extremely unpleasant I was able to retire at age 60 (had no consumer debt, even mortgage was paid off). I’ve enjoyed a comfortable retirement for a couple of years now without social security. Since I am leading a modest but comfortable life, by waiting I will have more money (larger social security payments) at a time I can anticipate higher costs for everything. The best thing about being frugal is that it gives you options that you wouldn’t have otherwise. I love taking clothing and recycling it for other uses. I have made dresses into aprons and given them as Christmas gifts with some of my homemade baking or canning. I have also made jeans into skirts for my girls by cutting them of at the crotch and then adding a ruffled or pleated skirt from either the leg of the pants if there is enough fabric or from another source. Used pants also make great aprons and toys, I like to use the pockets and buttons as design elements. I do have a bunny but he is a pet, he gets two carrots daily and an apple every three days. In the spring and summer he loves to eat all of our dandelion leaves. Thank you for reminding me of ways we can take things further. You are a very smart young person. Great post. Love leOne tiny thing though. In lesson one, 1st bullet, instead of “scrap” every last bit of the jam, etc. I think you mean “scrape” every last bit? Thanks for letting me know! I just fixed it! Samantha, just Pinned this. Love seeing one so young practicing these “greatest generation” tips. My Grandma would think well of you! I didn’t have time to read all the comments, so I hope I’m not repeating someone else’s tip….I discovered this because my hands are now stiff from arthritis. When you think you’ve reached the end of anything in a squeezy tube (hand-cream, toothpaste etc), cut it in half horizontally, scrape the remains from the top half into the bottom part (with the flip-top), then squeeze the bottom half together gently from the sides until you can fit the top over, push down as far as it will go. You will be amazed at how much is left in that ’empty’ tube! Use your common sense and obviously don’t use this for food that you’re not going to eat up immediately or face cream that will go near eyes or mouth (germs!). Also, adding pulses into meat dishes makes them go much further – e.g. lentils + minced beef = spaghetti sauce. I was born in 1948 when food was still rationed in the UK. My mother and grandmother’s frugal habits have rubbed off on me and I cannot throw out anything with a usable zip or buttons, or anything that will cut up into dish-rags, dusters or car-cleaning rags. I regularly visit charity (thrift) shops and if I like the fabric in a garment I will buy it, unpick it and make it into something else. I could go on…and on…just to say Thanks! for a trip down memory lane. Having just been through Hurricane Maria in Puerto Rico last September, we had a crash course in frugality. I was more than a month without electricity and a month without running water. You could do a whole article on conserving water and uses for gray water. I realized how much we waste on an average day. I learned to cook using everything and precise quantities so there would be no leftovers (no fridge). I even pulled out the cloth diapers. In times of need one becomes inventive. It’s what we do when we have plenty that defines us. Thank you for this helpful article. Wow, I’m so sorry for your circumstances! But, good for you guys for making the best with your difficult situation! Thanks for your comment, Cynthia! That is very true, frugality does seem like a game! Those are great ways to really save and resuse! Loved your article. My mom told me that one thing they did during the depression was using saved bacon grease as butter for toast and such. Thank you! That is really smart! Great tips, Yvette! Thanks so much! I save on toothpaste by cutting off the bottom when the tube is flat & can squeeze out more toothpaste, when that stops, I keep cutting further up. Lastly I cut the tube straight up & can get 2 more uses out of it. I save the tinfoil I use to heat food in my toaster oven by wiping it clean if it’s not greasy and reusing it. I buy all my paper goods & cleaning supplies at the $ store. We were living in Denver when the telecom crash hit the local economy badly. The Denver Post interviewed people, including a stay at home mom whose husband worked in a notoriously unstable industry, about how they were economizing. Mom’s sacrifice? The family of five was eating out ONLY two or three times a week. She apparently felt this was cutting right down to the bone.